The Ghost and the Guest is an interesting album that was recorded in a simple bedroom studio and was released last year by LDS artist Jake Workman. Loyal Linescratchers followers may recognize Jake from his days with the group “The Sweater Friends”. Prior to listening to this album, I had never heard any of his music, and knew little about him. So, it was with a completely fresh and unbiased perspective that I was able to sit down and listen to his music. I reviewed the album in a digital download form and found that the download contained much more than just music. Graphics from the album are included, as is a scanned copy of a handwritten thank you note from Jake. Most interesting though was a large booklet, which was conveniently provided in a number of different e-reader formats. Right about here is where things started to get weird, interesting, or sentimental – depending on how you look at it. The included e-book comes in at over 40 pages. In the preface, we learn that the songs were inspired by the life of Henry Pickett Pratt, who was born in 1866, and left a journal about some of his early life – a journal which was read by Jake Workman. Something about this man and his experiences struck a chord (pun intended) with Jake, and provided the inspiration for the songs on the album. The e-book includes portions of the journal that provide a backdrop of sorts for the songs. Jake has intended for the journal and the music to be enjoyed simultaneously in order to get the full experience of what he intended to create and capture. Blair Hodges, whom you probably know best as an insightful reviewer of smart-person books you never quite manage to read, also does drums and vocals (usually backup) and kazoo for the band Jiminy Finn and the Moneydiggers. We’ll talk more about the kazoo later. I finally loaded Da Korum’s latest EP into iTunes yesterday. Based on all the hype surrounding Worlds Without Numba, I was expecting a masterpiece. It’s a piece alright. This was the longest 11.5 minutes of my life. I have had visits to the dentist that were less painful. I would rather see Betty White naked (and confess it to my bishop) than listen to this album again. I will spare you the horror of listening to this album by describing this (I hesitate to call it “musical”) train wreck. So horrific, in fact, that I’m sure it will cause many “Nights without Slumba”. “Back (4 Tha Furst Time)”: My main recollection of this song was that they said “yo” an awful lot and mentioned R.L. Stine. Though the Goosebumps series would hardly qualify as high literature, I was pleasantly surprised to hear they read at all. A third grade reading level is apropos; that seems to be their emotional age. “U Don’t Understand Me” feat. Grizelle: I had already assumed Da Korum were a couple of 20-somethings still living at home. This song confirmed my suspicions with the line, “when I turned 18, I ran away from home and worked at Arby’s for two weeks until I moved back home.” Is it even possible to run away from home once you’re 18? Though I can hardly stomach listening to a couple of spoiled adult children rap about how rough their lives are, I actually felt sorry for the dude who went to summer camp and didn’t earn a single merit badge. He breaks down and cries right in the midst of recording. Why didn’t they edit that part out? I’m guessing they spent all their allowance and had no money left to cover the costs of re-doing the vocals. Studio time IS expensive. Despite all of that, this song is probably the highlight of the CD. I am impressed with the female vocals. I am amazed that they even speak to girls, let alone convince them to appear on a record. She probably just works for the studio. “Worldz Without Numba”: This is easily the worst astronomy lesson ever taught. If the members of Da Korum actually received high school diplomas, they should be taken away immediately and all their teachers should be fired. Do they even teach spelling in school anymore? They change “care” to “ker” so they can rhyme with “err” (which is their new version of “air”). Did you not realize “care” and “air” already rhymed? Da Korum seem to be sadly ignorant of how sadly ignorant they are. They even attempt to dazzle us with their knowledge of the Theory of Relativity. I wouldn’t be surprised if Einstein starts to haunt them for this botch job. Can they just hie to Kolob and never come back? Three brief reviews of three brief things. … an awesome group from Texas called Haun’s Mill (formerly Haun’s Mill Massacre). They do old-timey music but it’s more of a Southern Gothic-type thing, and their stage show includes weird and admittedly creepy projector movies. A lot of their lyrics deal with old dark times, like the Spanish Influenza epidemic or the Great Depression, etc. I immediately replied that they sounded awesome—like someone had tapped into my id and found the music it secretly wanted. An hour and fifteen minutes later, he wrote back to say he might be able to get an album sent to me. It was too late because I had already bought it. My id would not be denied! I knew this could go either way. It could be my fate to love this band because, really, how could I not like a gothfolkMormoncreepoöldtimey band? Or it could be that, with my expectations running so high, even the greatest gothfolkMormoncreepoöldtimey band ever to play Kolob could not live up to what I envisioned. For a few weeks now, I’ve been listening to the latest effort from the Aquabats, and contemplating my critique. Having done a number of reviews and critiques over the years, this one has been the hardest, because it is such a unique project. 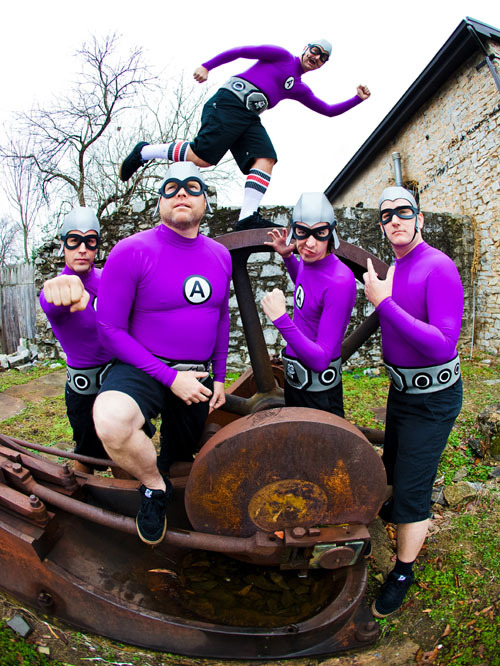 I have heard of the Aquabats but had never heard their music until now. So, rather than review this by comparing and contrasting it with past works, I am simply going to focus on this particular body of work. So, to point out the obvious… this is not your “typical” band. With their spandex “rash guard” super hero shirts and their anti-negativity helmets, they not only deliver everything you would want from a world famous rock band, but they also travel the planet in their highly customized Winnebego fighting crime, including notorious bad guys like Gasface and Kitty Litter. Or at least that’s what I hear.